Katie Beth Carter, 18, was killed in a vehicle accident on Monday, September 5 while returning to Jacksonville State University from a weekend at home in Ringgold, Georgia. Katie was a new member of JSU’s Marching Ballerinas, and the CollegeMarching.com team wishes to express our sincere condolences to the JSU community during this difficult time. The below feature is published in her honor. Readers who wish to support the Carter family can do so through a GoFundMe account that has raised nearly $40,000 for medical expenses and funeral arrangements. In addition, a scholarship fund in Katie’s honor has been set up at the North Georgia Community Federal Credit Union in Ringgold. 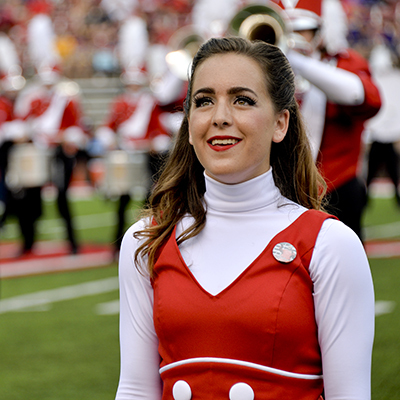 Jacksonville State University’s Marching Southerners are preparing for their second week without one of their beloved Marching Ballerinas, Katie Beth Carter. Katie was a freshman elementary education major at JSU, and performed in her first and final game on Thursday, September 1. In an official university statement, Ballerinas coordinator Noelle Stovall said Carter expressed to her fellow Ballerinas that the past few months were the happiest she had ever been. During JSU’s matchup with LSU on Sept. 10, the Marching Southerners dedicated their halftime show to Katie Beth’s memory, with a poignant performance this year’s Heroes: Lost & Fallen production. In addition, LSU’s band performed “Amazing Grace” during their halftime show in her honor. Bodiford said students and staff received word of the fatal accident on the evening of Sept. 5, just four days before they were scheduled to leave for their matchup against LSU. In addition to the vigil, Katie is being remembered through a scholarship fund at the North Georgia Community Federal Credit Union, and a GoFundMe account to assist her family with medical and funeral expenses. Musician Taylor Swift donated $5,000 to the account, commenting that she was thinking and praying for the family, and she knows they’ll keep Katie’s memory alive. As for the Marching Southerners, their work continues this weekend with a Band Day home matchup against Coastal Carolina. Though things may logistically be getting back to normal, they’ll still be taking the field with heavy hearts.